Home > KMS	> KMS ver. 1.2.274 – Skill Balancing & Dynamic Field Battle Changes! Level 25: Consumes (1875 HP → 5% HP). Create a shield from (15% → 20%) of your maximum HP that absorbs damage for 5 seconds. When the shield’s duration ends or the skill is reused, it will explode dealing 1000% damage 5 times on up to 12 enemies nearby. 2 seconds after the shield has been created, you can reuse the skill to manually explode it. Cooldown: 15 seconds. Level 25: Passive effect: Whenever you charge Elemental Charge, automatically create 1 hammer that moves around you. Up to 5 can be created at one time and they share the same duration as your Elemental Charge buff. The hammers will deal 400% damage 2 times on up to 4 nearby enemies, and based on the number of hammers summoned, their attack speed will be increased. Active effect: Consumes 1000 MP. Enhance your hammers for 30 seconds, allowing them to deal (1250% → 1050%) damage 3 times on up to 8 nearby enemies in a bigger range. Cooldown: 60 seconds. Level 25: Consumes (450 MP → 1000 MP). Beholder moves in front of the Dark Knight and deals (450% → 375%) damage 2 times on up to 10 enemies for 3 seconds. Cooldown: 20 seconds. Level 25: Consumes (1000 → 500) MP. Create poison clouds, which deal 1000% damage 6 times on enemies in range. Enemies hit will be inflicted with DoT for 10 seconds, dealing 600% damage every second. Enemies damaged by one poison cloud will not be damaged if they move in the range of another. Two seconds after the poison clouds have been created, you can use Mist Eruption to explode them, dealing 600% damage 6 times on up to 12 enemies. The explosion damage will stack if an enemy is in range of more than one poison cloud. Cooldown: 30 seconds. Level 25: Consumes 1000 MP. Create an icy area that deals 1000% damage 10 times on up to 15 enemies then persists for (25 → 30) seconds, dealing 500% damage continuously and increasing Freeze stacks. Cooldown: 60 seconds. Level 25: Consumes 1000 MP. Summon lightning that strikes 8 times, dealing 1500% damage 8 times on up to 12 enemies. The lightning will gradually move forward but will continue to strike at its current if it cannot move forward. (→ If the lightning hits the same enemy multiple times, its final damage will be decreased by 10% per strike.) Cooldown: 30 seconds. Level 25: Consumes 1000 MP. For (55 → 42) seconds, create an area for party members that increases their final damage by (10% → 5%), heals (2% → 1%) of their max HP and MP every few seconds, and removes status effects every few seconds. Final damage boost will be increased by 1% per 1500 INT, up to a maximum of (70% → 75%) final damage. HP/MP heal will be increased by 1% per 2000 INT, up to a maximum of (15% → 10%). Attack speed boost will be increased by 10000 INT per attack speed stage, up to a maximum of 3 stages. You will receive 40% of the effects of the final damage boost. Cooldown: (120 → 180) seconds. Level 25: Consumes 1000 MP. For (42 → 30) seconds, summon the angel of balance. The angel will look different based on the current activation status of Bishop’s Vengeance of Angel. Cooldown: 120 seconds. Deactivated: every 5 seconds, the angel of benevolence will heal 15% of party members’ max HP and increase their damage by (5% → 5% + 1% per 1250 INT, up to maximum of 100%) for 4 seconds. Activated: the angel of revenge will deal 1500% damage 8 times on up to 12 enemies. Enemies hit will receive an Angel’s Mark for 60 seconds, and the next holy attack used on them will consume the mark, increasing that attack’s final damage by 50%. Level 25: Consumes 800 MP. Create an afterimage that attacks enemies in range, dealing (600% → 800%) damage 3 times continuously for 3 seconds. Cooldown: 20 seconds. [Passive effect: while Afterimage Shot is on cooldown, every (12 → 10) attacks, automatically create an afterimage that attacks enemies in range, dealing (600% → 800%) damage 3 times continuously for 1 second.] The active effect and passive effect cannot be activated at the same time. Level 25: Consumes 800 MP. For 60 seconds, when Piercing or Sniping hits an enemy, the arrow will split, dealing 1200% damage 5 times on up to 10 enemies. Cooldown: (112 → 120) seconds. Eviscerate: skill logic has been changed and counterattack mechanic has been removed. This is basically a new skill now. Level 25: [Passive effect: Assassinate’s final attack will mark enemies with a Wounded debuff that lasts for 10 seconds and stacks up to 3 times. If you hit another enemy with Assassinate while there is another one that is marked, the original enemy’s mark will disappear and you will begin stacking it on the new enemy.] Active effect: Consumes 650 MP. Summon allies from the shadows that deal 1100% damage 5 times on up to 10 enemies. If there is an enemy with 3 Wound debuff stacks in range, you can use this skill with Assassinate to instantly move to that enemy and deal 3800% damage 6 times with an additional 100% critical rate and defense ignore. Gain 1 second of invincibility after attacking. Cooldown: 10 seconds. Level 25: Consumes 300 MP. Consumes (150 → 110) Energy per attack. Consumes (30 → 70) Energy per attack when your Energy is fully charged. (→ If this skill is attacking a boss monster, the Energy consumption is decreased by 60%). Automatically attack up to 10 nearby enemies, dealing 800% damage 3 times continuously. Cooldown: 3 seconds. Level 25: Passive effect: if Deadeye is not on cooldown, it will take aim at up to (15 → 12) enemies in range. If you use Deadeye when it is not correctly aimed, it will reset and begin aiming again. Active effect: Consumes 850 MP. Deals (1600% → 2400%) damage 4 times with an additional 100% critical rate on all enemies that were aimed at. By aiming more accurately, the damage can be increased up to 3x. Cooldown: (15 → 25) seconds. Level 25: Consumes 500 MP. Shoot a giant cannon ball that deals 825% damage 4 times on up to 15 enemies continuously. You prepare 1 cannonball every (20 → 25) seconds and can hold up to 3 at a time. Cooldown: 3 seconds. Level 25: Consumes 800 MP. Attacks up to 12 enemies 7 times. This skill can only be used while Royal Guard’s attack boost buff is active. Based on the number of stacks of the buff, the damage will be increased. After being used, Royal Guard’s attack buff’s duration (will be refreshed → will be increased by 6 seconds. However, this cannot exceed the maximum duration). All attacks have a 100% chance of inflicting Darkness for 10 seconds, decreasing enemies’ accuracy by 30%. The duration is halved on bosses. Cooldown: 12 seconds. Level 25: Consumes 1000 MP. For 30 seconds, Cross the Styx’ cooldown will not be applied and it will activate with maximum charge without having to charge it but its final damage will be decreased by (40% → 50%). When this skill is used, Cross the Styx’ cooldown will be reset. When Cross the Styx is used, create a crack in space for 10 seconds. If you continue to use Cross the Styx in the area of the crack, it will grow in size and finally explode, dealing 5200% damage 6 times on up to 15 enemies. You cannot create 2 or more cracks at the same time and you must wait 5 seconds after the explosion to create another crack. Cooldown: 240 seconds. Level 25: Consumes 250 MP. After being used, gain a buff for 30 seconds that can be stacked up to 6 times, each new effect will refresh the buff and stack with previous effects. Cooldown: 25 seconds. If the skill is not stacked and the duration ends, or the skill is stacked to the maximum, the cooldown is 240 seconds. [1st stack] Skill cooldowns (except those not affected by cooldown resets) will decrease (30% → 10%) faster. [3rd stack] 50 all stats. [4th stack] 22 attack/magic attack. [5th stack] 22% boss damage. [6th stack] invincibility for the entire duration. Level 25: Deals (1200% → 1000%) damage 7 times on up to 12 enemies for 4 seconds. Level 25: Consumes 1000 MP. For (8 → 6) seconds, summon a magic circle that attacks up to 10 enemies every few seconds. Cooldown: 30 seconds. Level 25: Consumes 650 MP. Summon an infantry for 10 seconds, each strike deals (500% → 415%) damage 9 times on up to 12 enemies. Cooldown: 25 seconds. Level 25: Consumes 100 MP. For 55 seconds, receive the effects of all your Auras at the same time, and Death will strengthen your Blow skills, consuming an extra 75 MP to deal an extra (250% → 300%) damage 12 times with an additional 50% critical rate and 50% defense ignore. Cooldown: 150 seconds. Level 25: Consumes 500 MP. Install a black magic altar for (20 → 40) seconds. The curse deals 1600% damage 4 times on up to 10 enemies. The curse takes 0.8 seconds to travel to the next altar, and if more than 2 altars are installed, the travel time is decreased by 15% per altar. Prepare an altar every (12.5 → 25) seconds, you can hold up to 4 altars at one time. Cooldown: (1.5 → 0.5) seconds. Level 25: Consumes 1000 MP. For 12 seconds, become invincible and deal 2000% damage 6 times on up to 15 enemies up to 3 times then perform a final attack, dealing 3000% damage 12 times with an additional 100% critical rate and 100% defense ignore. While attacking with this skill, you can press the skill again to instantly use the final attack. (→ This attack has a 100% chance of inflicting the maximum number of Another Bite debuffs). If this skill is used while not riding a Jaguar, you will automatically ride it and gain invincibility. Cooldown: 150 seconds. Level 25: Consumes (1000 → 250) MP. Consumes 1% maximum MP + (200 → 175) MP per second. The maximum Energy is increased by 20. The time it takes to charge Energy is halved. For every excess Energy, increase your final damage by 1%. Cooldown will apply when the skill is deactivated, all excess Energy will instantly disappear when it is deactivated. A plasma current will randomly be activated, dealing 1800% damage 6 times on up to 12 nearby enemies. Cooldown: 175 seconds. Level 25: Consumes 1000 MP. Install a container that fires 25 micro missiles that deal (400% → 850%) damage 5 times on up to 15 enemies each. Cooldown: (15 → 25) seconds. The number of Multi Kills required to complete the Multi Kill missions have been decreased. The Defeat an Elite Boss mission has been removed. New Sudden Missions have been added. Equipment rewards have been removed from Sudden Mission rewards. Level 100 and below Elite Bosses’ HP and experience rate have been decreased. Level 200 and higher Elite Monsters/Elite Bosses’ HP and experience rates have been increased. In Reboot World, an error where certain regular monsters, Elite Monsters, and Elite Bosses’ HP and experience would not increase past a certain point has been fixed. The maximum Combo Kill has been increased to 9999. A new stage of Combo Orbs has been added, starting from 2000 Combo. It gives more experience than the red orb from 750~1999 Combo. Your Combo Kill will now be retained after fighting an Elite Boss, entering Polo & Fritto’s bounty hunter missions or the Flame Wolf content. However, for Elite Bosses, if you change maps it will not be retained. For bounty hunter missions and Flame Wolf, if you stay for more than 20 seconds in the exit map, it will not be retained. The Rune of Revival‘s effects have been changed. Effect: increases HP and MP regeneration to the maximum, reduces all damage received, and increases resistance to status conditions. In addition, you also cannot be knocked back by enemy attacks. The Rune of Hordes has been removed. The Rune of Greed has been added. The cooldown before you can activate another Rune will now be shown in the buff window. An error where Bait would receive the effects of the Rune Persistence skill has been fixed. An error where sometimes the Bait cooldown would be applied incorrectly has been fixed. The Bait of Hordes has been removed. The cooldown before you can activate another Bait will now be shown in the buff window. In Polo’s hunting content, level 210 and higher monsters’ HP and experience have been increased. In Fritto‘s content, the clear experience for level 200 and higher has been increased. 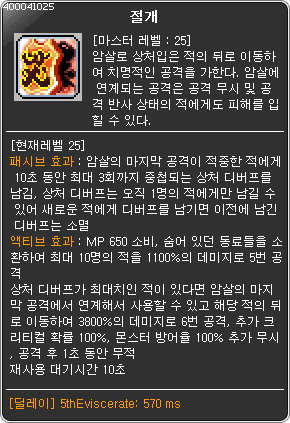 Flame Wolf’s maximum HP has been increased. A new stage of damage taken has been added to the Flame Wolf called Fatal. Characters who deal enough damage to reach the Fatal stage will receive 1 Best Hunter’s Bag. The experience given to characters level 200 or higher after leaving has been increased. The number of Best Hunter’s Bags given to characters who are inside the Flame Wolf’s Cave when it is defeated has been decreased from 2 to 1. The amount of attack/magic attack given for 16 Stars and higher when Star Forcing Arcane Shade equipment has been increased. Previously enhanced equipment will automatically have the updated values applied. After defeating the Garden’s Imps before a Root Abyss boss, the party leader must now enter the portal and all other party members will automatically enter at the same time. Changes to Boss Lucid have been made. In Lucid (Normal/Hard), if you die while fighting her and still have Death Count remaining, you will now automatically revive after 30 seconds. In Lucid (Normal/Hard), if you are dead when the boss is defeated, you will be moved to the reward map. In Lucid (Hard), in the ‘Crumbling Clocktower’ phase, an error where the damage was abnormally high has been fixed. Fantastic Theme Park’s BGM has been changed. Dream Breaker‘s UI has been changed. Certain items in the Maple Union Coin Shop have had their prices adjusted. You can no longer use the Quick Delivery service in the SEED. An error where the boss Vellum (Normal/Chaos) would sometimes be stuck in state where it could not be attacked if certain bind skills were used on it has been fixed. An error where the BGM would sometimes not go back to normal after using content that changes the BGM has been fixed. An error where the client would sometimes exit if you were matched with a Zero in Boss Queue has been fixed. An error where Mechanics could not get on or off their robot on The SEED’s 22nd floor has been fixed. An error where the boss Suu’s monster pattern was not applied normally if you entered alone has been fixed. An error where rewards you could not receive from certain content would still be shown in the Maple Guide has been fixed. You can now search for Arcane Symbols in the pet skill ‘Don’t Loot an Item’. The God of Control content’s entry has been removed. Entry has been restricted so that this content can return in the future with a new look. The Gold Apple item has been updated with new prizes! A bunch of Android Vouchers, including the Ponyroid, Suuroid, Orcaroid, Demianroid, and Aliciaroid are available from the Gold Apple. In addition, two new Android items have been added and can be acquired from the Gold Apple. The first is the Android Ear Sensor Clip. When used, your equipped Android’s ear sensor will become invisible. You can also use this item on Androids without ear sensors to bring them back. The second new item is the Android Shop Use Coupon (30 days), which when used allows your Android to access the Android shop feature for 30 days. In addition, you can get Magnificent Souls, new chairs (such as the Spring Flower Garden Chair and Glass Castle Chair) and new ridings (Bouncing Kickboard Riding, Banana Riding). The Royal Style Coupon has been updated with new items including the Soul of Atonement, Camellia Veil, Camellia Outfit, Soul of Atonement Robe, Requiem, and Erda’s Stream. A new Special Label set called the Sporty Picnic set has been added. If you collect all 5 items, you’ll also get the Puppy Picnic! Chair. The Master Label set has not been changed, it is still the Master Snow set. From March 2 to March 29, the Arcana Spirit Buddy pets will be on sale! They include the Small Spirit, the Tree Spirit, and the Rock Spirit! From March 2 to March 15, the New Chief Knights’ Hat Box and New Chief Knights’ Weapon Box will be sold. You will randomly receive 1 of 6 hats/weapons when you open the box. The Lovely White Day sale will take place from March 9 to March 22. The above love-themed items will all be on sale for the duration of this event! From March 16 to March 29, the Dark Force package will be sold for 6,000 NX. New Recruit! Your Club is…? The New Recruit! Your Club is…? event has begun and will run until March 6. Basically, there are three clubs recruiting new members: Runerup, Musculet, and Ocul. Each club has certain activities that they would like you to participate in, and for each one, you’ll gain some Closeness with that club. You can only do one activity at a time. For each day that you complete all three clubs’ activities, you’ll receive prizes. In addition, based on your closeness with each club, you’ll unlock various skills. These skills will expire on March 12. Level 2: 100% increase in Runes’ experience buff duration and 50% increase in Runes’ experience buff. (5,000 closeness). Level 3: 100% increase in Runes’ experience buff duration and 100% increase in Runes’ experience buff. (5,000 closeness). The White Day Sweet Gift event will run from March 11 to 14. 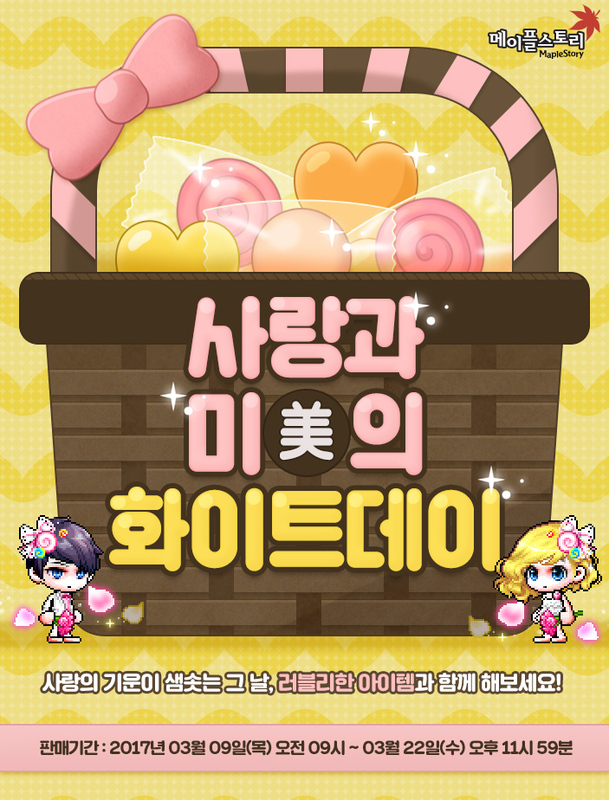 Basically, you just need to login during this event and you’ll receive the Sweet Gift Box! It has a bunch of items in it (but don’t worry, the box is account tradeable and you can remove items one-by-one). The Sunday Maple event will take place on March 12 and March 26. The Challenge! Maple Rainbow event will run from March 20 to March 26. Every day, you can choose one of seven missions, and if you complete them, you can choose one of seven rewards. You can complete 7 missions per day (14 on Saturday). You can repeat the same mission repeatedly or claim the same prizes multiple times if you want. There are seven missions you can choose from. You can choose one of seven rewards every time you finish a mission. If you complete the Find the Ribbon Pig’s House mission 10 times, you’ll get the Maple Navigation title (no stats, permanent). If you complete a total of 35 missions, you’ll receive the Challenge! Maple Rainbow! title (50 all stats, 20 attack/magic attack, 30% boss damage, 30% defense ignore, and 20000 HP/MP, stats expire on April 6). Thanks as always, Max. I really do like the new format for the skill changes. No problem 🙂 Yeah it looks a lot cleaner actually, I think I’ll use that format for regular skill changes as well (might edit this post tomorrow). And fixed! is it true that you get more dps from just using hurricane and not activating afterimage shot? also was the attack speed arrowstream build nerfed? It definitely used to be that way, I don’t know if this patch’s changes would make it actually worth it to use. Edit: I would say if they change the skill in such a way that you can cast Afterimage Shot when using your skills, then this is really worth. According to Insoya, Afterimage Shot is pretty worth using now. I looked at some Battle Analysis stuff and it’s powerful, even at level 1. It activates both Magic Arrows and also AFA now. Nope, they expire on March 12! Max i think you meant damage has been increased from 160% to 170% when mounted on Jaguar, and from 320% to 340% when dismounted? Oops, I haven’t played WH in a while lol. I’ll fix that! Hi Max, I noticed that the shadower eviscerate skill counterattack part is changed from 3800% 7 times to 6 times, is it true? Or just a mistake? T.T So sad if it’s true tho…. wth did they nerf it T_T or just typo? Ohhhh they added 1 sec of Invincibility frame but took out 1 attack, seems legit. Yep they decreased the number of hits from 7 to 6 but they made it give 1s of invincibility after use. Thanks for the post Max! It removes/adds those mechanical ear things all Androids have. (And I just realized I wrote ‘Eye Sensor’ instead of ‘Ear Sensor’, fixed! You don’t have to link it with assassinate immediately. The debuff stays on the enemy for 10 seconds(per stack?) so if you use it within that time frame you will teleport to the target for damage and 1 second immunity. That is pretty sweet. It can help with bossing by helping you dodge and teleport right next to mobile boss without hurting yourself, but I wouldn’t really know since I don’t play maple much. @ Boomerang… I thought about this for a moment, and I think it’s because he isn’t in range ( if you’re talking about this video https://www.youtube.com/watch?v=PDZvdbIEsQw .) I supposed the idea is still the same as the old version: it’s a counterattack move. Time it right, you deal some extra damage and not die against the likes of Arkarium’s instant kill. That second of invincibility is very precious if you played maple a long time ago. Shadowers timed B-step for that invincibility frame. Just to clarify my speculation, you DON’T have to link it with Assassinate but you DO have to be in range with the marked target. Max can confirm or reject what I said because I don’t know Korean and the guy video explained a lot. Anybody knows how to take a picture of a spirit? Nerfing NL again? Why? They are already poop compared to all other classes. Guess Nexon never got over pre BB; NL meta. Max, are you sure Union Strength 1 goes to 30? It seems like it should be to 10. Max, are you sure Union Strength 1 goes to 30? It seems that it should be to 10. Should I be sad that Aran received no changes? or be glad he wasn’t nerfed…again. Thank Max for this Changes. ^_^. Greatly Appreciated.. Its much easier to read and spot the changes between nerf and buff. Double Thumbs Up b(^_^)d.
Can you see if there are any other changes to wind breaker? After being used, Royal Guard’s attack buff’s duration (will be refreshed → [will be increased by 6 seconds. However, this cannot exceed the maximum duration] “highlighted in green”). Isn’t this a nerf? Because before, you could have added up to 12 extra seconds to Royal Guard’s attack buff if you used Claiomh Solais just before the attack buff expired. Hex Max, just wanna thank you for all the posts. They have been very helpful! These posts are really helpful. Thank you Max. For Night Walker, Mastery Damage +10%, is that “Damage” or Final Damage? Same for the bats? They’re both just ‘damage’, not ‘final damage’. no w8 a second, that cant be in this video you see he has the 1 sec on invincebility so this is kms not kmst??? I don’t see any 1 second buff when he uses it? Hey, Max. Do you know how long the reactivation cooldowns are now for the Automatic Healing skills and Unending Attack? I think you should be able to see the new cooldown if you go to any Arcane River town with a Nodecrafting NPC and search up the skills. Hey Max, then only these changes made up to the real servers? the Night Lords final damage nerfs to advanced star handling didn’t make it to the official server? I read somewhere people saying there were some changes not listed in the patch notes for overall classes but I would rather hear it from you than other sources I don’t trust. Yep these are the official changes. And some of them were not mentioned in the patch notes (like the NW Shadow Servant buffs) but I added them as well. I see a lot of good NX stuff, A chibi Empress weapon cover is something I would jump on asap. Currently im playing 210 lvl I/L mage, should i continue to play it or creat a new character since his dpm is so low compare to many other job. Demon Avenger is really call demon job? Skill animation noob than other job. KMST ver. 1.2.048 – Drop Rate Changes KMST ver. 1.2047 – Skill Balancing & Combat Changes!